Every year, a fun and inspiring event is hostessed in Oklahoma City by Cindy Winters of the fabulous Paper Crown fame called Glitter Market. If you're lucky, you might catch it twice a year, but most definitely at least once a year in the late fall. Last year, I really enjoyed being a vendor. I was surrounded by some of my most favorite creative people, and honored to be vending among them. This year, due to several things but mostly due to our families newest arrival, I won't be vending. I had high hopes that I'd be able to pull it off, but alas it didn't happen. 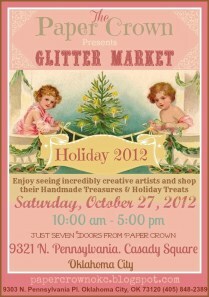 However, just because I'm not vending doesn't mean I intend to miss out on the fun! I'm still planning to make the drive up to OKC because I've got it on good authority that some of my favorite people will be vending again this year. I have my fingers crossed that I'll be able to make it (that is, if Charleigh can handle the drive! ), because it would hurt my heart (to use a Freddy description) to miss out on it entirely. You are our most favorite of all sweet Heather! Hope you get to come! We can't wait to get our hands on that little bundle of sweetness! So nice of you to post this Heather. Would love to see you!